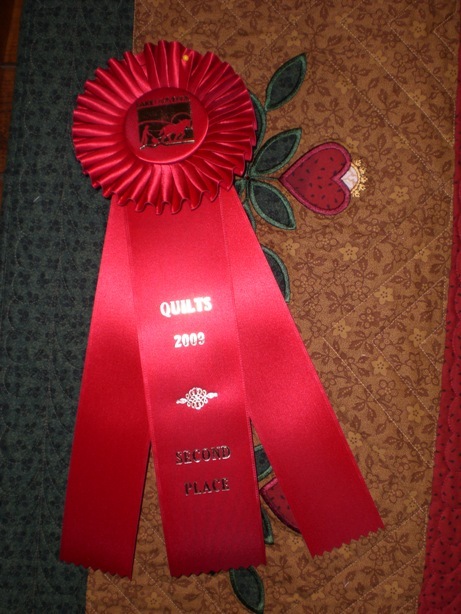 Garden Party Quilt is a prize winner! 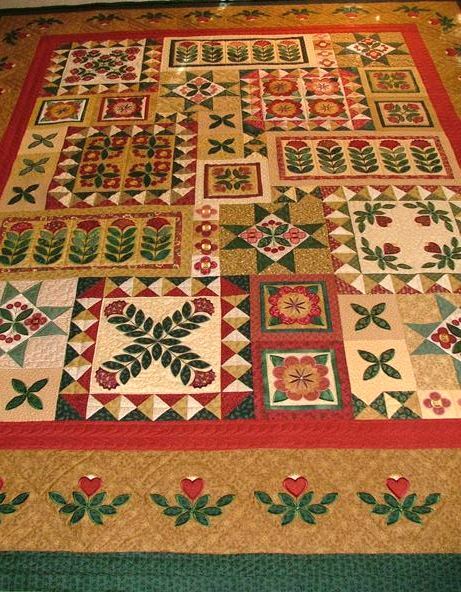 "This quilt was my first quilting project on my new embroidery machine. When the instructor teaching the class on how to use the machine pattern became ill, I decided to forge ahead and also to really stretch and make the queen-size quilt. My daughter was moving to a new apartment, and -- since her favorite color is red -- it had to be for her!" If you're anything like me, the first thing you think of when you are this happy is the Snoopy Dance theme song --- this music has been dancing around in my head ever since Leslie told me she won the prize! This quilt was one of my favorites to work with! Brought to me by a wonderful woman who embroidered every block, she told me the story of how she was making it for her daughter. 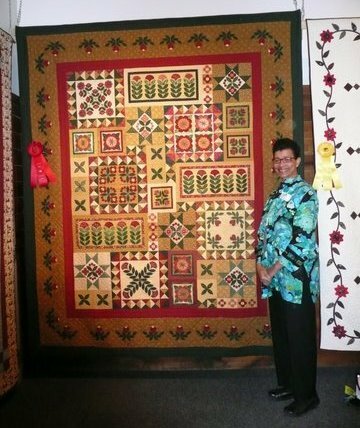 It has more work, joy, and talent, and love than any other quilt I have had the honor of doing. Here is a picture of the entire quilt: Each block demanded different treatment, so we put our heads together, and came up with designs that incorporated hearts --- to play on the theme of love and family. 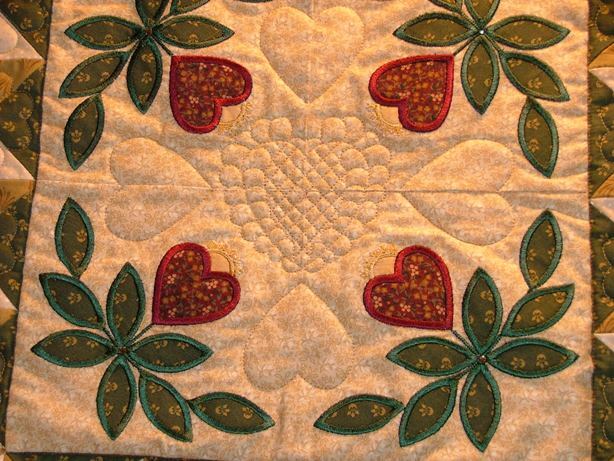 My favorite: We added lots of hearts throughout the quilt, in many surprising places! 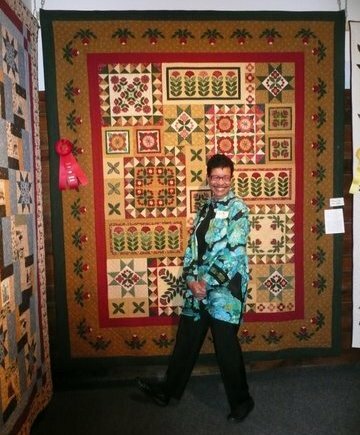 Receiving a hug from Leslie when this quilt was done was one of my happiest moments! This one was a bit of a challenge --- but then again, I just LOVE a challenge! I received an embroidered quilt top that just "demanded" to be cross-hatched in the center. I didn't want to stitch across any of the letters, because that would squash the satin stitches. I also didn't want to do tie-offs at every letter, though.... so I came up with this little technique for "cheating". Do the cross-hatching as you normally would. 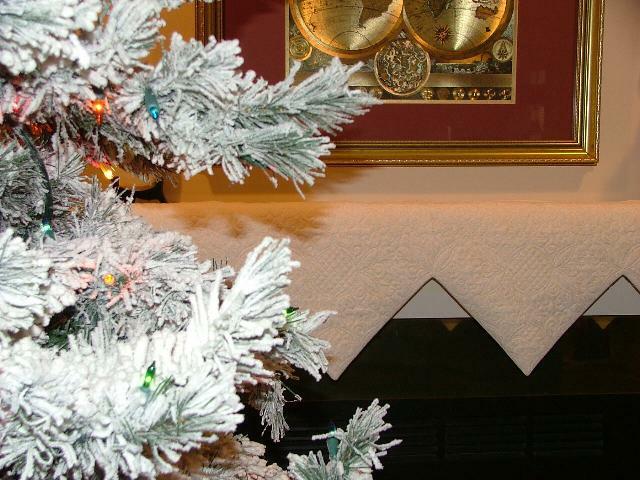 Take a close look at the small photo that shows a close-up of the letter with the crystal in it. If you look at the blue satin stitch portion of the letter itself, you can see where I "jumped" over the blue portion of the letter during the cross-hatching process. The width of the jump stitch is less than 1/4 of an inch, but if I had stitched right through the letter, it would have crushed the satin stitches. This was done with white thread, so as a result there were little tiny white jump stitches showing on most of the letters. I went to the fabric store, and bought a fine tip permanent fabric marker -- the kind with the tiny micron tip -- in exactly the same shade of blue as the letters. That's the most critical part -- matching the thread color. Now, all you have to do is "color" the white thread that is laying on top of the satin stitches. 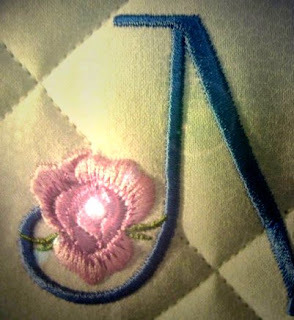 The single thread will fade into the background of the satin stitches, and look just like another single stitch. On the back of the quilt, you will not want to cut those tiny stitches, or there will be some unraveling of your cross-hatching in the future. For the jumps over the pink floral portion of the quilt, I did tie-offs, and started again on the other side. These letters stitch out beautifully! Enjoy!